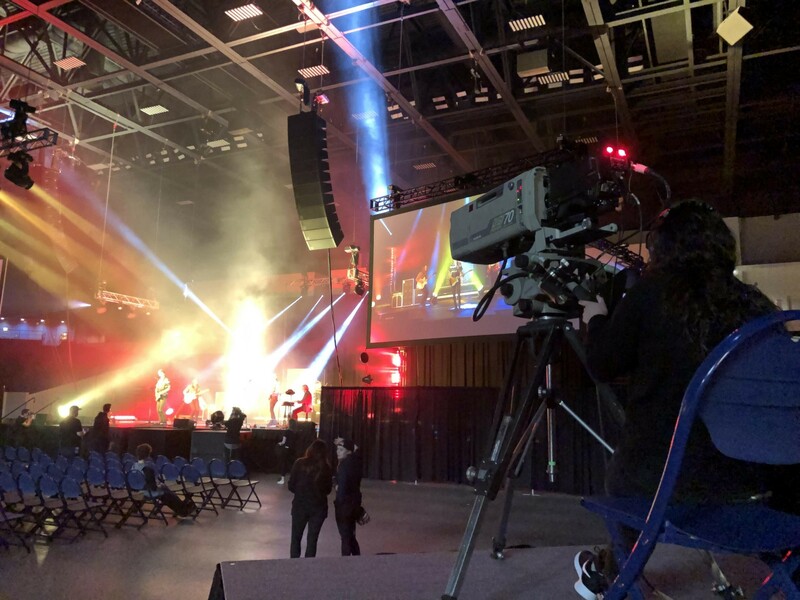 At Belmont University’s recent 2019 Rock Showcase, d&b audiotechnik’s KSL Line Array, one of the newest sound system technologies to hit the market, was provided by local touring sound specialists Spectrum Sound. The system was announced a mere two weeks earlier at NAMM. The KSL line array, coupled with the associated SL-Sub, presents a major leap forward in live concert touring technology, and Belmont’s Rock Showcase was one of the first applications using this technology by Spectrum Sound and anyone else in the industry. Students from Instructor of Audio Engineering Technology Scott Munsell’s Advanced Sound Reinforcement Class and Sound Systems Engineering Class worked alongside professional engineers and Belmont alumni Rudd Lance, Ashley Burns, Dylan Summerville and Jordan Baker from Spectrum Sound and Parnelli Award-winning System Engineer Andrew Dowling from Clair Global before and during the show. In the weeks leading up to the show, Regional Manager and Belmont alumnus Jeremy Seawell, Product Manager Werner “Vier” Bayer and Head of R&D Acoustics Matthias Christner of d&b audiotechnik paid a visit to the Sound Systems Engineering Class to explain the technology behind the array and answer student questions about its deployment and application. Coincidentally, this ties into an upcoming study abroad trip headed by Audio Engineering Technology faculty Ben Poff and Scott Munsell to the d&b factory in Backnang, Germany for a study on the design and manufacture of sound reinforcement systems.